For the Filipino telecom company, see Sky Cable Corporation. Sky Limited is a British media and telecommunications conglomerate. Headquartered in London, it has operations in the United Kingdom, Ireland, Germany, Austria, Switzerland, Italy and Spain. Sky is Europe's largest media company and pay-TV broadcaster by revenue (as of 2018[update]), with 23 million subscribers and more than 31,000 employees as of 2019. The company is primarily involved in satellite television and broadband services. Initially formed in 1990 by the equal merger of Sky Television and British Satellite Broadcasting, BSkyB became the UK's largest digital pay television company. In 2014, after completing the acquisition of Sky Italia and Sky Deutschland, the merged company changed its name to Sky plc. Prior to November 2018, Rupert Murdoch's 21st Century Fox owned a 39.14% controlling stake in the company; on 9 December 2016, following a previous attempt under News Corporation that was affected by the News International phone hacking scandal, 21st Century Fox announced that it had agreed to buy the remainder of Sky, pending government approval. However, after a bidding war that included The Walt Disney Company (which was, in turn, acquiring most of 21st Century Fox assets), U.S. media and telecoms conglomerate Comcast acquired the entirety of Sky in 2018 for £17.28 per-share. Before the acquisition by Comcast, Sky was listed on the London Stock Exchange and was a constituent of the FTSE 100 Index and had a market capitalisation of approximately £18.75 billion (€26.76 billion) as of 2018. British Sky Broadcasting (BSkyB) was formed by the merger of Sky Television and British Satellite Broadcasting on 2 November 1990. Both companies had begun to struggle financially and were suffering financial losses as they competed against each other for viewers. The Guardian later characterised the merger as "effectively a takeover by News Corporation". The merger was investigated by Office of Fair Trading and was cleared a month later since many of the represented views were more concerned about contractual arrangements which had nothing to do with competition. The Independent Broadcasting Authority was not consulted about the deal; after approval, the IBA demanded precise details about the merger, stated they were considering the repercussions of the deal to ultimately determine whether BSB contracts were null and void. On 17 November, the IBA decided to terminate BSB's contract, but not immediately, as it was deemed unfair to 120,000 viewers who had bought BSB devices. Sam Chisholm was appointed CEO in a bid to reorganise the new company, which, continued to make losses of £10 million per week. The defunct BSB's HQ, Marco Polo House were sold, 39% of the new company's employees were made redundant to leave just under 1000 employees, many of the new senior BSkyB executive roles were given to Sky personnel with many BSB leaving the company. In April the nine Sky/BSB channels had been condensed into five, with EuroSport being dropped soon after the Sky Sports launch. Chisholm also renegotiated the merged company's expensive deals with the Hollywood studios, slashing the minimum guaranteed payments. The defunct Marcopolo I satellite was sold in December 1993 to Sweden's NSAB, and Marcopolo II went to Norway's Telenor in July 1992 after the ITC was unable to find new companies to take over the BSB licences and compete with BSkyB. News International received 50%, Pearson PLC 17.5%, Chargeurs 17.5%, Granada 12%, Reed International 2% of the new shares in the company. By September 1991, the weekly losses had been reduced to £1.5M a week, Rupert Murdoch said "there were strong financial marketing and political reason[s] for making the compromise merger instead of letting BSB die. Many of the lessons had been learnt with more than half the running cost of the combined company". Further cuts in losses were a direct result of 313,000 new customers joining during the first half of 1991. By March 1992, BSkyB posted its first operating profits, of £100,000 per week, with £3.8 million weekly from subscriptions and £1 million from advertising, but continued to be burdened with £1.28 billion of debt. James Capel forecast BSkyB would still be indebted in 2000. In the autumn of 1991, talks were held for the broadcast rights for Premier League for a five-year period, from the 1992 season. ITV were the current rights holders for the Football League, and fought hard to gain the new rights. ITV had increased its offer from £18m to £34m per year to obtain the new rights. BSkyB joined forces with the BBC to make a counter bid. The BBC was given the highlights of most of the matches, while BSkyB paying £304m for the Premier League rights, would give them a monopoly of all live matches, up to 60 per year from the 1992–93 season. Murdoch has described sport as a "battering ram" for pay-television, providing a strong customer base. A few weeks after the deal, ITV went to the High court to get an injunction as it believed their details were leaked before the decision was taken. ITV also asked the Office of Fair Trading to also investigate since it believed Rupert Murdoch's media empire via the newspapers had influence the deal. A few days later neither action took effect, ITV believed BSkyB was telephoned and informed of its £262m bid, and Premier League advised BSkyB to increase its counter bid. BSkyB retained the rights paying £670m for the 1997–2001 deal, but was challenged by On Digital for the rights from 2001–2004, thus it was forced to pay £1.1 billion which gave it 66 live games a year. Following a lengthy legal battle with the European Commission, which deemed the exclusivity of the rights to be against the interests of competition and the consumer, BSkyB's monopoly came to an end from the 2007–08 season. In May 2006, the Irish broadcaster Setanta Sports was awarded two of the six Premiership packages that the English FA offered to broadcasters. Sky picked up the remaining four for £1.3bn. In October 1994, BSkyB announced its plans to float the company on the UK and US stock exchanges, selling off 20% of the company. The stock flotation reduced Murdoch's holding to 40 percent and raised £900m, which allowed the company to cut its debt in half. Sam Chisholm said "By any standards this is an excellent result, in every area of the company has performed strongly". Chisholm, became one of the world's most highly paid television executives. 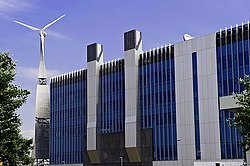 In 1995, BSkyB opened its second customer management centre at Dunfermline, Scotland, in addition to its original centre at Livingston which opened in 1989. BSkyB entered the FTSE 100 index, operation profits increased to £155M a year, and Pearson sold off its 17.5% stake in the company. Sam Chisholm resigned from BSkyB due to a rift with Rupert Murdoch. A week later, Murdoch was quoted as saying "I cannot understand the fuss; BSkyB was grossly overpriced", which caused further rifts with the new management. In 1997, BSkyB formed a partnership with Carlton and Granada to bid for the right for the new digital terrestrial network. In June, it was awarded the right to start the service, ONdigital under the condition BSkyB withdrew from the group's bid. In February 2003 BSkyB wished to renegotiate its deal with MTV to reduce its payment from £20m. Chief executive Tony Ball said "We're definitely prepared to stare them down if we can't get a sensible deal, MTV, and other channels, have done particularly well out of the growth of Sky but the opportunity for savings is now there and Sky will be taking it," he added. "MTV has done extremely well out of that original deal." On 17 April 2003 BSkyB launched its own range of music channels Scuzz, Flaunt and The Amp, as part of its plan to create its own original channels for the platform. Within 18 months the channels failed to make impact, and were outsourced to the Chart Show Channels company. Shortly afterwards it acquired Artsworld, giving a majority of subscribers full access to the channel. The buyout was part of James Murdoch's strategy to improve the perceptions BSkyB which could lead to potential new subscribers. John Cassy, the channel manager of Artsworld, said: "It is great news for the arts that a dedicated cultural channel will be available to millions of households." In early 2007 Freeview overtook Sky Digital with nearly 200,000 more subscribers at the end of 2006, while cable broadcaster Virgin Media had three million customers. In July 2007, BSkyB announced the takeover of Amstrad for £125m, a 23.7% premium on its market capitalisation. On 4 June 2010, BSkyB and Virgin Media announced that they had reached agreement for the acquisition by BSkyB of Virgin Media Television. Virgin1 was also a part of the deal and was rebranded as Channel One on 3 September 2010, as the Virgin name was not licensed to Sky. The new carriage deals are understood to be for up to nine years. On 29 June 2010, The Competition Authority in Ireland cleared the proposed transaction. On 20 July 2010, The Office of Fair Trading announced that they would review BSkyB's acquisition of the Virgin Media Television business to judge whether it posed any competition concerns in the UK. The OFT planned to investigate the deal to see whether it could constitute a qualifying merger under the Enterprise Act 2002. The watchdog invited interested parties from the industry to comment on the sale, including its potential impact on the pay-TV market. On 14 September 2010, the OFT decided not to refer BSkyB's takeover of Virgin Media's TV channels to the Competition Commission. In June 2010, News Corporation made a bid for complete ownership of BSkyB. However, following the News International phone hacking scandal, critics and politicians began to question the appropriateness of the proposed takeover. The resulting reaction forced News Corp. to withdraw its bid for the company in July 2011. The scandal forced the resignation of James Murdoch, who was the chairman of both BSkyB and News International, from his executive positions in the UK, with Nicholas Ferguson taking over as Chairman of BSkyB. In September 2012, Ofcom ruled that BSkyB was still fit to hold broadcast licenses in the UK, but criticised James Murdoch's handling of the scandal. On 28 June 2013, News Corporation was split into two publicly-traded companies; the company's publishing operations (including News International, renamed News UK) and broadcasting operations in Australia were spun into a new company known as News Corp, while the company's broadcast media assets, including its 39.14% stake in Sky, were renamed 21st Century Fox. On 12 May 2014, BSkyB confirmed that it was in talks with its largest shareholder, 21st Century Fox, about acquiring 21st Century Fox's 57.4% stake in Sky Deutschland and its 100% stake in Sky Italia. The enlarged company (dubbed "Sky Europe" in the media) will consolidate 21st Century Fox's European digital TV assets into one company. The £4.9 billion takeover deal was formally announced on 25 July, where BSkyB would acquire 21st Century Fox's stakes in Sky Deutschland and Sky Italia. BSkyB also made a required takeover offer to Sky Deutschland's minority shareholders, resulting in BSkyB acquiring 89.71% of Sky Deutschland's share capital. The acquisitions were completed on 13 November. British Sky Broadcasting Group plc changed its name to Sky plc to reflect the European acquisitions, and the United Kingdom operations were renamed Sky UK Limited. Sky plc bought out the remaining minority shareholders in Sky Deutschland during 2015, using a squeeze-out procedure to obtain the remaining shares and delist Sky Deutschland on 15 September 2015. On 9 December 2016, 21st Century Fox announced that it had made an offer to acquire the remainder of Sky plc for £11.7 billion at a value of £10.75 per-share. It marks Fox's second attempt to take over Sky, as its previous attempt under News Corporation was affected by the News International scandal. The two companies reached an agreement on the deal on 15 December; it is subject to regulatory approval. Ofcom expressed concern that this purchase would give the Murdoch family "material influence over news providers with a significant presence across all key platforms" and "increased influence over the UK news agenda and the political process". However, the regulator did deem that a Fox-owned Sky would be "fit and proper" to hold broadcast licences, despite the recent sexual harassment controversies that had emerged at the U.S. Fox News Channel, as there was no evidence to the contrary. Avaaz opposed Ofcom's opinion, stating that the regulator "made mistake after mistake in deciding to give the Murdochs a clean bill of health to take over more of our media". The Walt Disney Company announced on 14 December 2017, that it would acquire 21st Century Fox, including its stake in Sky plc but barring specific U.S. assets. Fox stated that this purchase would "not alter [its] full commitment and obligation to conclude our proposed transaction". Analysts suggested that Disney's proposed transaction could ease regulatory concerns over Fox's purchase of Sky, as the company will eventually lose its ties to the Murdoch family. Disney has a narrower scope of media ownership in the country than the Murdoch family. Sky already has a relationship with Disney for its Sky Cinema service, holding pay television rights to its films in the United Kingdom and operating a dedicated Sky Cinema channel devoted to Disney content. A preliminary report by the Competition and Markets Authority issued January 2018 called for the insulation or outright divestment of Sky News as a condition of the purchase, so that it is editorially independent from the Murdoch family. Sky had threatened to reevaluate the channel's continued operations if they "unduly impeded merger and/or other corporate opportunities available in relation to Sky's broader business". The channel has operated on a loss of at least £40 million per-year. In February 2018, Fox proposed the establishment of an independent editorial board, and committing to fund the network for at least 10 years. This commitment would be inherited by Disney after the completion of its purchase of 21st Century Fox. On 3 April 2018, Fox stated that Disney had "expressed an interest in acquiring Sky News", which would not be conditional on its proposal to acquire 21st Century Fox. A bidding war began 25 April 2018, when the competing U.S. media and telecoms conglomerate Comcast (owner of NBCUniversal), announced a counter-offer for Sky at £12.50 per-share, or approximately £22.1 billion. NBCUniversal CEO Steve Burke stated that purchasing Sky would roughly double its presence in English-speaking markets, and allow for synergies between the respective networks and studios of NBCUniversal and Sky. On 5 June 2018, Culture Secretary Matt Hancock cleared both 21st Century Fox and Comcast's respective offers to acquire Sky plc. Fox's offer is contingent on the divestiture of Sky News. On 12 June 2018, Comcast announced a US$65 billion counter-offer to acquire the 21st Century Fox assets that Disney had offered to purchase. However, Fox subsequently agreed to an increased, US$71.3 billion offer from Disney instead. On 15 June 2018, the European Commission gave antitrust clearance to Comcast's offer to purchase Sky, citing that in terms of their current assets in Europe, there would be limited impact on competition. Comcast included a 10-year commitment to the operations and funding of Sky News similar to that of Disney's offer. On 19 June 2018, Disney formally agreed to acquire Sky News as part of Fox's proposed bid, with a 15-year commitment to increase its annual funding from £90 million to £100 million. On 11 July 2018, Fox increased its bid for Sky to £14.00 per-share, valuing it at £24.5 billion. Comcast subsequently counterbid just hours later with an offer at £14.75 per-share, valued at £26 billion. On 19 July 2018, after Fox agreed to a Disney counter-offer, it was reported that Comcast had abandoned its bid for 21st Century Fox to focus solely on Sky. On 20 September 2018, the Panel on Takeovers and Mergers ordered that a blind auction be held "in order to provide an orderly framework for the resolution of this competitive situation". In this process, Fox, followed by Comcast, made new cash-only bids for Sky. After these first two rounds of bidding, there would be a third round where both companies could make new offers. However, the third round of bidding would only be binding if both companies make a bid. The results were to be revealed on 22 September, and be confirmed by the start of trading on 24 September. Comcast won the auction with a bid of £17.28 per-share, beating Fox's bid of £15.67. Sky plc had until 11 October to formally accept this offer. Following its auction victory, Comcast began to acquire Sky shares from the open market. On 26 September 2018, Fox subsequently announced its intent to sell all of its shares in Sky plc to Comcast for £12 billion. On 4 October 2018, Fox completed the sale of their shares, giving Comcast a 76.8% controlling stake at the time. On 12 October 2018, Comcast announced it will compulsorily acquire the rest of Sky after its bid gained acceptances from 95.3% of the broadcaster's shareholders. Sky was delisted on 7 November 2018 after Comcast acquired all remaining shares. The first CEO of BSkyB was Sam Chisholm, who was CEO of Sky TV before the merger. Chisholm served in this position until 1997. He was followed by Mark Booth who was credited with leading the company through the introduction of Sky. Tony Ball was appointed in 1999 and completed the company's analogue to digital conversion. He is also credited with returning the company to profit and bringing subscriber numbers to new heights. In 2003, Ball announced his resignation and James Murdoch, son of Rupert Murdoch was announced as his successor. This appointment caused allegations of nepotism from shareholders. On 7 December 2007, it was announced that Rupert Murdoch would be stepping down as BSkyB's non-executive chairman and would be replaced by his son, James. In turn, James stepped down as CEO of BSkyB, to be replaced by Jeremy Darroch. The current company directors are Comcast personnel; Michael J Cavanagh (Comcast Senior VP & CFO), Arthur R Block (Legal Counsel) and David L Cohen (Senior VP & CDO). In February 2019 The Economist magazine claimed that Sky enjoys gross margins of 50%. The original Sky Television plc, now a holding company for Sky's United Kingdom operations. Operating company for the Sky pay-television service. Home installations of satellite dishes and set-top boxes. Operating companies for Sky's broadband and telephony services, including Be Un Limited which was acquired from Telefónica UK/O2. Operating company for Sky pay-television service in Ireland. Operating company for Sky pay-television service in Italy. Operating company for Sky pay-television service in Germany and Austria. In September 2017, Sky launched an over-the-top video streaming service in Spain, featuring content from 21st Century Fox, Disney, NBCUniversal, Turner and Viacom. In May 2017, Sky Deutschland acquired Homedia, operator of the Swiss over-the-top streaming company Hollystar. Sky subsequently launched Sky Sport as an OTT service in Switzerland, followed by an OTT entertainment service known as Sky Show in 2018. British electronics company acquired by BSkyB. An internet broadcast company owned by Sky. A free Satellite television service similar to Freesat and Freeview. Wi-Fi provider acquired by BSkyB. A&E Networks UK (50%) – with A&E Networks. Operates History, Lifetime and CI channels. Bad Wolf Ltd (minority stake) – with HBO. Drama production company. Love Productions (70%) – Production company of The Great British Bake Off. DTV Services Ltd (20%) – with Arqiva, BBC, Channel 4 and ITV plc. Manages and markets the Freeview brand. A video on demand movie rental service. Now closed down. Japan Sky Broadcasting [ja] (JSkyB) – with SoftBank Corp.
Operating company for Sky pay-television service in Japan. Sold to DirecTV and later absorbed into SKY PerfecTV! Beamly (10%) – Sold to Coty, Inc.
ITV plc has been the subject of a flurry of rumoured take-over and merger bids since it was formed. For example, on 9 November 2006, NTL announced that it had approached ITV plc about a proposed merger. The merger was effectively blocked by BSkyB on 17 November 2006 when it controversially bought a 17.9% stake in ITV plc for £940 million, a move that attracted anger from NTL shareholder Richard Branson and an investigation from media and telecoms regulator Ofcom. On 6 December 2006, NTL announced that it had complained to the Office of Fair Trading about BSkyB's move. NTL stated that it had withdrawn its attempt to buy ITV plc, citing that it did not believe that there was any possibility to make a deal on favourable terms. On 17 July 2014, BSkyB's 6.4% stake in ITV was sold to Liberty Global, valued at £481 million. ^ a b c d e f "Results for the twelve months ended 30 June 2017". BSkyB. July 2017. Retrieved 17 March 2018. ^ a b "Sky at a glance" (PDF). Sky. Retrieved 1 November 2018. ^ "Leading European pay TV operators by revenue 2018". Statista. Retrieved 1 November 2018. ^ Farrell, Michael. "Sky Winner Will Be Determined This Weekend". Broadcasting & Cable. Retrieved 19 December 2018. ^ Williams, Christopher (26 January 2017). "Sky to launch full pay-TV over broadband as it struggles to hold on to satellite subscribers". The Telegraph. ISSN 0307-1235. Retrieved 19 December 2018. ^ Mike, Snider (15 December 2016). "Murdoch's Fox acquires U.K.'s Sky network". USA Today. Retrieved 16 November 2018. ^ a b "Sky creates Europe's leading entertainment company". Sky. 13 November 2014. Retrieved 13 November 2014. ^ "Phone Scandal Poses Defining Test for a Murdoch Son". The New York Times. 8 July 2011. Archived from the original on 9 July 2011. Retrieved 10 July 2011. ^ "FTSE All-Share Index Ranking". stockchallenge.co.uk. Retrieved 26 December 2011. ^ a b Sky TV's launch: 'a wing and a prayer' , media editor Maggie Brown, Guardian Organgrinder blog, 5 February 2009 Retrieved 24 December 2012. ^ Canal Digital. "The Canal Digital Story". canaldigital.com. Retrieved 21 March 2015. ^ Douglas, Torin (12 March 1999). "Murdoch's rise to the top". BBC News. Retrieved 5 March 2007. ^ George Trefgarne, Financial Correspondent (15 June 2000). "BSkyB leaps on soccer result". Telegraph.co.uk. Retrieved 21 March 2015. ^ "Setanta joins Premiership action". BBC News. 5 May 2006. Retrieved 5 March 2007. ^ "Sky and MTV in cash row". 14 February 2003. ^ Is channel growth music to the ears? | Archive. Marketing Week (20 March 2003). Retrieved on 9 December 2013. ^ BSkyB hands running of music channels to chart channels | Archive. Marketing Week (16 September 2004). Retrieved on 9 December 2013. ^ Gibson, Owen (20 June 2005). "Sky buys out arts channel". The Guardian. London. ^ "Freeview 'overtakes Sky Digital'". BBC News. 19 April 2007. ^ a b "BSkyB agrees £125m Amstrad deal". BBC News. 31 July 2007. Archived from the original on 6 August 2007. Retrieved 31 July 2007. ^ "BskyB and Virgin Media Reach Agreements on Sale of VMtv and Channel Distribution". BSkyB. 4 June 2010. Archived from the original on 8 June 2010. Retrieved 4 June 2010. ^ "Virgin secures new Sky carriage deal after VMtv sale". Broadband TV News. 4 June 2010. ^ Sweney, Mark (5 August 2010). "BSkyB rebrands Virgin1 as Channel One". The Guardian. UK. ^ Deans, Jason (4 June 2010). "BSkyB buys Virgin Media TV channels for £160m". The Guardian. UK. ^ "Competition Authority clears the acquisition by British Sky Broadcasting Limited of Virgin Media Television" (PDF). The Competition Authority. 29 June 2010. Archived from the original (PDF) on 30 April 2011. Retrieved 30 June 2010. ^ "OFT to review Sky's VMtv deal". Digital Spy. 20 July 2010. ^ "OFT okays Sky's Virgin Media TV deal". C21Media. 14 September 2010. ^ "News Corp withdraws bid for BSkyB". BBC. 13 July 2011. Retrieved 13 July 2011. ^ Chandrasekhar, Indu; Wardrop, Murray; Trotman, Andy (13 July 2011). "News of the World phone hacking scandal: timeline". London: Telegraph. Archived from the original on 14 July 2011. Retrieved 14 July 2011. ^ "James Murdoch resigns as BSkyB chairman". BBC News. 3 April 2012. Retrieved 9 December 2015. ^ O'Carroll, Lisa; Davies, Lizzy (20 September 2012). "Sky ruled fit for broadcast licence, but James Murdoch comes in for criticism". The Guardian. ISSN 0261-3077. Retrieved 13 July 2017. ^ "News Corp. divides into two companies; 21st Century Fox is born". Los Angeles Times. 28 June 2013. Retrieved 12 April 2017. ^ Williams, Christopher (12 May 2014). "'Sky Europe': what is behind BSkyB's effort to buy Murdoch's European pay-TV businesses?". Telegraph.co.uk. Telegraph Media Group. Retrieved 19 June 2014. ^ Gallivan, Rory (15 September 2015). "Sky completes full acquisition of Sky Deutschland". Marketwatch. Retrieved 9 December 2015. ^ "21st Century Fox Agrees to Buy Sky". Bloomberg. Retrieved 11 December 2016. ^ "Sky and 21st Century Fox agree £18.5bn takeover deal". BBC News. Retrieved 15 December 2016. ^ "Fox News Scandals, Political Influence Concerns Cast Long Shadow Over Sky Review". Variety. Retrieved 29 June 2017. ^ "Murdoch's Sky bid likely to be referred to competition authorities". The Guardian. 29 June 2017. Retrieved 29 June 2017. ^ "Major Setback for Murdoch in $15 Billion Sky Takeover". The New York Times. Retrieved 29 June 2017. ^ "Fox's Sky Deal Faces Challenge to "Fit and Proper" Decision". The Hollywood Reporter. Retrieved 29 September 2017. ^ White, Peter (14 December 2017). "Disney-Fox Deal: Sky Deal Still On The Table, Expected To Close By June 2018". Deadline. Retrieved 14 December 2017. ^ Deans, Jason (21 February 2013). "Sky Movies Disney: new channel to show UK TV film premieres". The Guardian. ISSN 0261-3077. Retrieved 15 December 2017. ^ Sweney, Mark (23 January 2018). "Rupert Murdoch's Sky bid is not in public interest, says regulator". The Guardian. Retrieved 24 January 2018. ^ "Sky threatens to shut down Sky News". BBC News. 8 November 2017. Retrieved 22 February 2018. ^ Plummer, Robert (15 December 2017). "Sky News faces uncertain future". BBC News. Retrieved 22 February 2018. ^ "Fox Ties Disney to Sky News Guarantee to Win Takeover Approval". Bloomberg. 20 February 2018. Retrieved 22 February 2018. ^ Mitchell, Robert (20 February 2018). "Fox Offers to Increase Sky News Commitment to Satisfy British Competition Watchdog". Variety. Retrieved 22 February 2018. ^ Clarke, Stewart (3 April 2018). "Disney Could Acquire Sky News in Fox-Sky Deal's Latest Twist". Variety. Retrieved 3 April 2018. ^ "Murdoch bid for Sky challenged by US giant". BBC News. 27 February 2018. Retrieved 27 February 2018. ^ Haring, Bruce (12 February 2018). "Comcast Mulls Renewing Its 21st Century Fox Assets Pursuit – Report". Deadline Hollywood. Retrieved 24 February 2018. ^ "Comcast May Make Another Bid for 21st Century Fox (Report)". Variety. 12 February 2018. Retrieved 24 February 2018. ^ Wilson, Bill (25 April 2018). "Comcast starts £22bn bidding war for Sky". BBC News. Retrieved 25 April 2018. ^ White, Peter (27 February 2018). "NBCU's Steve Burke Claims Comcast's $31B Sky Deal Will Boost Scripted TV & Film Fortunes, Fox Notes No "Firm Offer" Was Made; 21st Century Fox Reacts – Update". Deadline Hollywood. Retrieved 27 February 2018. ^ "Sky bid battle looms after government nod". BBC News. 5 June 2018. Retrieved 5 June 2018. ^ Szalai, Georg. "U.K. Approves Fox's Sky Bid, Subject to Sale of Sky News, and Clears Comcast Offer". The Hollywood Reporter. Retrieved 5 June 2018. ^ "Comcast makes $65 billion offer to steal 21st Century Fox away from Disney". The Verge. Retrieved 13 June 2018. ^ Hagey, Keach; Schwartzel, Erich (21 June 2018). "21st Century Fox Agrees to Higher Offer From Disney". Wall Street Journal. ISSN 0099-9660. Retrieved 26 June 2018. ^ "EU Clears Comcast's Bid for Sky". The Hollywood Reporter. Retrieved 18 June 2018. ^ "Walt Disney Agrees to Acquire Sky News, Annual Funding to Be Boosted to $130M". The Hollywood Reporter. Retrieved 19 June 2018. ^ "Murdoch's Fox increases Sky bid". BBC News. 11 July 2018. Retrieved 11 July 2018. ^ Clarke, Stewart (13 July 2018). "U.K. Takeover Body Hikes Price Disney Would Need to Offer for Sky". Variety. Retrieved 13 July 2018. ^ "Sorry, Comcast: Fox and Disney sign new merger deal, rejecting Comcast bid". Ars Technica. Retrieved 20 June 2018. ^ "Disney Ups Its Bid for 21st Century Fox to $71.3 Billion". The New York Times. Retrieved 20 June 2018. ^ "Comcast likely to be new owner of Sky". BBC News. 19 July 2018. Retrieved 21 July 2018. ^ Ramachandran, Shalini (19 July 2018). "Comcast Drops Bid for Fox Assets, Will Focus on Pursuit of Sky". Wall Street Journal. ISSN 0099-9660. Retrieved 21 July 2018. ^ Waterson, Jim (20 September 2018). "Sky takeover battle must go to auction, orders regulator". the Guardian. Retrieved 20 September 2018. ^ Clark, Kate (22 September 2018). "Comcast outbids Fox in $40B battle for Sky". TechCrunch. Retrieved 22 September 2018. ^ "Sky: Comcast outbids Fox with £30bn bid for broadcaster". BBC News. 22 September 2018. Retrieved 22 September 2018. ^ a b Clarke, Stewart (25 September 2018). "Comcast Buys Over 30% of Sky on Open Market, Seeks More Before Takeover Deadline". Variety. Retrieved 27 September 2018. ^ Waterson, Jim (26 September 2018). "Rupert Murdoch's Sky reign to end as Fox sells all shares to Comcast". The Guardian. Retrieved 27 September 2018. ^ Clarke, Stewart (9 October 2018). "Comcast Closes Deal for Fox's Sky Stake, Owns Over 75% of European Pay-TV Giant". Variety. Retrieved 11 October 2018. ^ "BSkyB – Investor Relations – Press Release". Phx.corporate-ir.net. 7 December 2007. Retrieved 18 April 2011. ^ "Sky PLC | DueDil". www.duedil.com. Archived from the original on 8 December 2015. Retrieved 1 December 2015. ^ "Has Comcast bet against technology?". The Economist. 31 January 2019. ISSN 0013-0613. Retrieved 6 February 2019. ^ Forrester, Chris (2011). High Above: The untold story of Astra, Europe's leading satellite company. Springer. ISBN 978-3642120084. ^ "Sky Subscriber Services". Virgin Media. Retrieved 17 March 2018. ^ "Mr Stuart Trigg v Sky In-home Services Ltd". Employment Tribunal. 25 April 2017. Retrieved 17 March 2018. ^ "Sky Q to allow people to do away with satellite dish". Think broadband. Retrieved 17 March 2018. ^ "Sky to invest Euro 1bn in Dublin HQ". Irish Times. 28 January 2013. Retrieved 17 March 2018. ^ Christoph Steitz and Harro Ten Wolde (14 January 2013). "News Corp to grab control of Sky Deutschland". Reuters. ^ "Sky launches Netflix rival in Switzerland". Broadband TV News. 2 March 2018. Retrieved 19 December 2018. ^ "Sky acquires Swiss OTT TV provider Homedia". Digital TV Europe. 4 May 2017. Retrieved 19 December 2018. ^ "Sky Deutschland launches Sky Sport in Switzerland". IHS Technology. Retrieved 19 December 2018. ^ "BSkyB reels in Wi-Fi network operator The Cloud". The Register. 27 January 2011. Retrieved 26 June 2013. ^ Thorne, Clive D.; Davis, Georgia. "High Court finds that 'history' can be repeated". International Law Office. Globe Business Media Group. Retrieved 28 November 2016. ^ "Sky Corporate | Articles". Sky. Retrieved 10 March 2019. ^ "UK games channel targets 12m viewers". Market for Home Computing and Video Games. 23 February 2011. ^ a b c "Group investments". Annual Report 2009. British Sky Broadcasting. 2010. p. 109. Archived from the original (PDF) on 25 September 2009. Retrieved 20 March 2010. ^ "Sky acquires majority stake in Love Productions". BSkyB. 21 July 2014. Retrieved 21 July 2014. ^ Lanier, Liz; Lanier, Liz (13 September 2018). "New Venture Skybound Stories Will Create Mobile Narrative Experiences". Variety. Retrieved 18 March 2019. ^ "About us". Freeview. Archived from the original on 5 April 2010. Retrieved 20 March 2010. Freeview is managed by DTV Services Ltd, a company owned and run by its five shareholders – BBC, BSkyB, Channel 4, ITV and Arqiva. ^ "Sky acquires Acetrax as it prepares for NOW TV launch". Digital Spy. 3 May 2012. Retrieved 23 January 2013. ^ Welsh, James (21 November 2006). "Ofcom examines impact of Sky's ITV stake". Digital Spy. Archived from the original on 27 November 2006. Retrieved 6 December 2006.